I saw a fantastic documentary last night, called “Sketches of Frank Gehry“and I must recommend it to anyone interested in modern architecture. 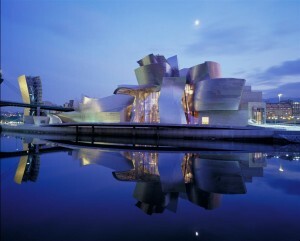 Frank Gehry, most widely known for the Bilbao Guggenheim, is a very interesting character, and I didn’t know much about the man behind his architecture until last night. Its a very thought provoking film, and I think its worth the watch even if you don’t like modern architecture. The movie was produced and directed by his personal friend, Sydney Pollack (or Will’s Father, from Will & Grace as I knew him!) and gives a very personal look into the life of this incredible man. The film features interviews with some very well known celebrities who are Gehry’s friends and admirers, including the artist Ed Ruscha, architect Philip Johnson, artist and film maker Julian Schnabel, musician Bob Geldoff and actor Dennis Hopper, among others. I’m not sure whether it is available on DVD yet, but if it is I suggest you go get yourself a copy!